Distressed clothes are nothing new, but do these luxury sneakers take it too far? Distressed denim is one thing, but these shoes take the worn-out look to a new level — and people aren't happy. 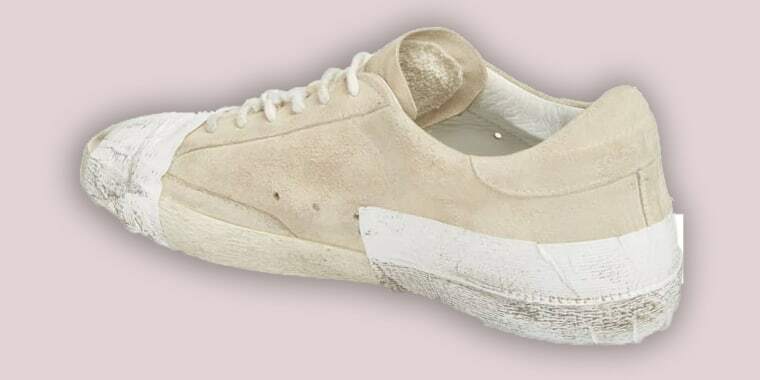 Social media users are outraged after spotting a pair of Golden Goose sneakers made to look as if they are taped across the toe and heel, accusing the luxury Italian fashion brand of glorifying poverty. The hardest part for critics to wrap their heads around? The high-end sneaks cost $530. "Crumply, hold-it-all-together tape details a distressed leather sneaker in a retro low profile with a signature sidewall star and a grungy rubber cupsole," reads a description of the Superstar Taped Sneaker on Nordstrom's website. Many people expressed disgust and called the brand out on Twitter. "Poverty is real," one wrote. "I've been bulled for wearing thrifted clothes before thrifting was 'cool,' and now we have high-end brands capitalizing upon many people's past and current poverty-related suffering." Another person suggested that anyone who has that much cash to spend a pair of sneakers ought to instead donate the money to a homeless person. Yet others pointed out that Golden Goose has been doing the distressed thing for years. As one person wrote, "fashion is stupid, next." If you are mad at this.. well your late to the game. Golden goose has been creating pre distressed, worn in, dirty, and in this case taped shoes as an aesthetic piece for years. It is what their customers expect. If you can afford it and are willing to then who are you to judge? Sure enough, the popular brand has plenty of similar styles out there — like this and this. And it's true that clothes made to look less than brand-new have been around for a while. Who doesn't own a pair of ripped jeans? The company has not yet responded to TODAY Style's request for comment.